The board of directors (BoD) of the Social Fund for the Development (SFD) held the first meeting for the current year on 16 January 2011 under the chairmanship of HE the Prime Minister, BoD Chairman, Dr. Ali Mohamed Mujawar. The meeting discussed and approved the SFD's 2011 Annual Work Plan (AWP) for the implementation of 1,535 projects at an estimated cost of $245 million. The plan covers four programs: Community & Local Development (860 projects worth $173 million), Capacity building (460: $18 million), Small and Micro Enterprises Development (27: $8.5 million) and Labor Intensive Works (187: $45.3 million). At the sector level, such distribution is as follows: Education Sector: 471 projects (worth $81.5 million); Water: 304 ($70 million); Rural Roads: 119 ($29 million); Health: 109 ($7.5 million); Agriculture: 91 ($12.5 million), Training: 84 ($3 million). The remaining 354 projects are distributed over other programs and sectors, including the Environment, Integrated Interventions, Small and Micro Enterprises Development & Business Development Services, Cultural Heritage, Groups with Special Needs and Organizational Support. Contribution of local beneficiary communities mounts to $37.7 million of the total mentioned cost and that of the AWP's total investment cost. 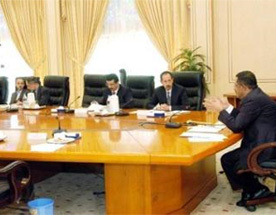 After the approval, SFD's Management briefed the BoD on the performance of 2010 plan.